In November of last year we received this report from Alfredo Hau, former student of Crisanto Kumul and Valladolid congreso participant in the advanced workshop. The following is his report. “Between August and October, 2012, I (José Alfredo Hau Caamal) took part in a project regarding care of the cultural legacy in communities close to the archaeological site of Chichén Itzá, in which we included activities such as epigraphy. The project consisted of offering workshops about the way to care for the cultural legacy, including Maya hieroglyphs. 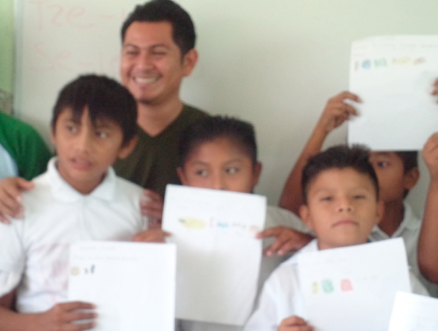 So as to gain a better understanding, the children were taught to write their names using the ancient Maya script. In order to do this, we used the Maya syllabary; they were first offered a brief explanation concerning the use of the writing system; then, they were offered the required materials and they embarked on their own discovery of the way of writing with this system, helped by an instructor. The workshops were held in the community of Pisté Tinum, Xkopteil, Chankom and Sotuta. Students of the Jacinto Canek school from the Pisté Tinum community and José Alfredo Hau Caamal.